Kick your feet up and relax with this ottoman. The top of the ottoman features a welted box top cushion for style and comfort. The base of the ottoman is skirted to match the rest of the collection. Pair this ottoman with the matching chair for an excellent place to rest in your living room. The William Skirted Box Top Ottoman by England at Van Hill Furniture in the Grand Rapids, Holland, Zeeland area. Product availability may vary. Contact us for the most current availability on this product. 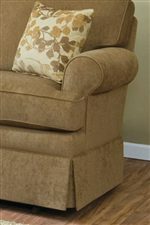 The traditional style and comfort of the William collection is a wonderful fit for your living room or den. The collection features welted reversible t-cushions on the backs and seats for optimal comfort and a classy look. The small welted rolled arms and skirted bases help to add to the traditional style of the set. This collection offers stationary sofa, loveseat, and chair, glider loveseat and chair, full sleeper sofa, and an ottoman. Whether it's just one piece or an entire living room set, the William collection is a beautiful and comfortable collection in your living room. The William collection is a great option if you are looking for Traditional furniture in the Grand Rapids, Holland, Zeeland area. Browse other items in the William collection from Van Hill Furniture in the Grand Rapids, Holland, Zeeland area.